By year-end 2013 there will be some 2 billion active smartphones and tablets in the world, and they will outnumber PCs by a significant margin. The proliferation of these gadgets is happening right under our noses, but many analysts still underestimate mobile device diffusion, and the flow-through effect on usage. Smartphones and tablets take desktop functionality and put it in a more appealing package, which is why they've already attracted one-fifth of total media consumption time. A recent report from BI Intelligence, Business Insider’s subscription research service, digs into the latest mobile usage trends, explain why there's still plenty of runway left for mobile industry growth, and identifies the businesses that stand to gain the most. Data from the first quarter of 2013 from Flurry shows that a significant majority of consumer time spent on mobile apps was dedicated to video, gaming, and social networking. What's more, users spent an average of 93 minutes a day on the top mobile activities in the first quarter of this year, compared to 77 minutes in the same quarter a year ago. That's a 20% increase in mobile app usage in just 12 months. That's an impressive gain considering how far along we are in the smartphone and tablet revolution, with major markets already past 50% penetrated. 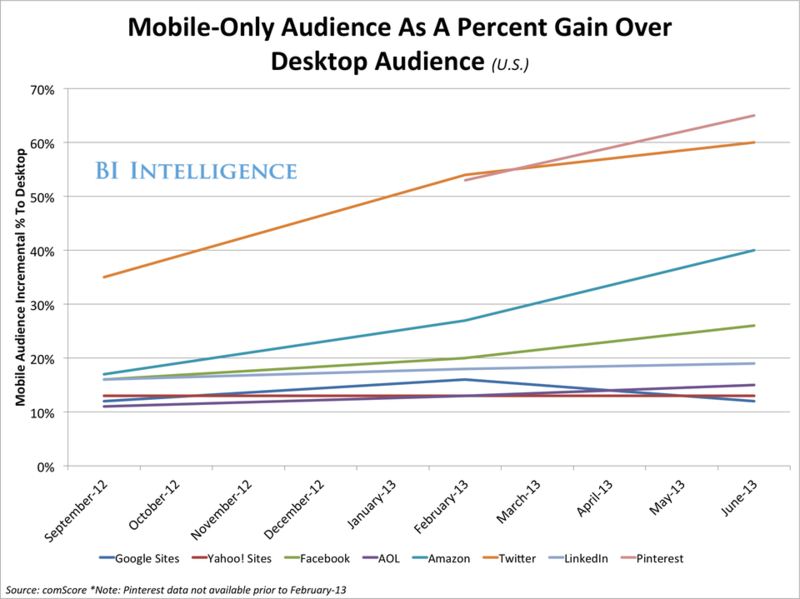 It suggests that there's still significant roadway for mobile usage growth. Gaming remains the top activity: The average consumer spends 40 minutes of their day playing a game on an app. Looking again at time spent in various mobile app categories, social networking was second to games, occupying an average 30 minutes of time per day, per user. Meanwhile entertainment, which is dominated by video-watching, averaged about 10 minutes. Top Internet properties are seeing double-digit gains in their audience size thanks to mobile-only users of their mobile websites and apps. Mobile-only users are 40% of Pinterest's user base. We also discuss how tech companies, social networks, and app developers are shifting business models to accommodate their growing mobile-centric user bases. This report is an update to our popular January 2013 report on mobile usage, which also discussed the rise of mobile video and TV, mobile-social synergies, the mobile takeover of existing popular media categories, and the death of one-stop-shop Internet giants.